A practice Claudine Tyrell first used when marking English assignments encapsulates her approach to being a classroom teacher, guidance counsellor and athletic coach. In her third year of teaching, Tyrell’s success with students in the classroom, through the guidance office and on the sports field led parents on the Home and School Council at Malvern Collegiate Institute in the Toronto DSB to nominate her for a Premier’s Award for Teaching Excellence in the New Teacher of the Year category. Malvern principal Line Pinard, OCT, explains why she heartily supported Tyrell’s nomination. “Claudine has a passion for teaching and for kids. She sees extracurricular activities as an important vehicle for teenagers who haven’t found their way yet. “She reaches the whole child, not just the academic child,” continues Pinard. “She has a diverse range of qualifications – Special Education, English, French, guidance and career education – and a broad background that combine to make her an effective teacher. Tyrell worked for 10 years in business before deciding to become a teacher. And she played rugby herself as a student – at Agincourt Collegiate Institute in the Toronto DSB, at university and on the provincial women’s team. Tyrell, unlike many new teachers, has never been afraid to ask questions of her more experienced colleagues. Nor does she consider asking for help to be a sign of weakness. And she never comes to a colleague empty-handed. She prepares something first and then asks for specific feedback on what she has done. It’s important to support all children so they feel safe and comfortable and happy at school. That’s another way we can help give them success. Tyrell reflects on the outstanding peer feedback that has become part of her own professional practice. For example, Malvern phys ed head Doug Underwood, OCT, taught her how to handle the mountains of paperwork required to run a sports team. And English colleague Ray Fallis, OCT, taught her how to organize and structure every element of parent interviews. Although she no longer plays elite-level rugby, Tyrell continues to challenge herself by running half-marathons. Her eye is always on improving her times. It’s the same with her teaching. When she first taught Macbeth, her goal was to connect the language and story to her students’ interests and life experiences. She soon had senior English students out of their seats, acting out the plays. Lateness is rarely an issue after a comment like that. Students often write that they’re nervous about making presentations. Tyrell works with that. She allows them to present with a partner, perhaps in front of a small group instead of the whole class. She uses what she calls a Toastmasters approach: Start small, allow students to stay within their comfort zones and let them experience success before moving up to longer and more formal presentations. She applies that same respectful, success-based and continual-improvement attitude to written assignments, often asking students to resubmit something when she knows they can do better. And yes, no matter how poor a paper is, she always writes a positive comment first. The success culture culminates in Miss Tyrell’s English Awards. At the start of each semester, she tells her students there will be awards – not for the highest mark but for most improved, best effort and so on. 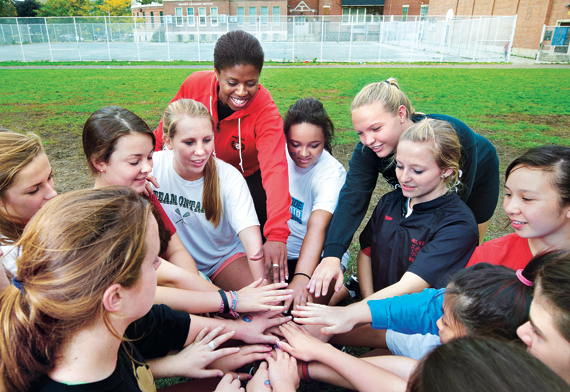 When Tyrell first began teaching at Malvern, she knew she wanted to coach rugby and cross-country. In fact, she completed her practise-teaching internship at the school and kept working with the rugby team after her practicum ended. That’s one of the many things that impressed Pinard, the school principal. They tracked times, developed complex training schedules and followed protocols that Tyrell didn’t have a clue about. She worked hard, read everything she could find, watched what her peers were doing and kept her head down. She also looked for mentors – in this case Al Baigent, OCT, and Stephen Masterson, OCT, the track coaches at Neil McNeil Catholic Secondary School in the Toronto Catholic DSB. Again, she asked for structured feedback: “Here’s what I’m thinking of doing; what do you think?” And it worked. At the conclusion of last year’s city championships, Dave Christiani, now retired from teaching but still coaching at Leaside High School, came up to her and said, “Congratulations. I’m very proud of you.” That meant the world to Tyrell, and it has encouraged her to do even better this year. Tyrell doesn’t restrict her professional learning to coaching. In the past four years, she says, she has probably attended every PD workshop available to her. She has already earned her Guidance and Career Education, Specialist AQ and will take Special Education, Part 2 this summer. Tyrell’s focus this year has fallen on guidance, where she worked part-time last year and is working full-time this year. Malvern is a heavily academic school, and the majority of students choose college or university. Tyrell wants to help them and their parents make informed choices. She created a Grade 12 forum last year and will run it again this December. The idea is to bring back Malvern grads who are attending postsecondary institutions as part of a panel discussion for current Grade 12 students. It’s not about promoting their college or university, Tyrell explains, but about sharing their experiences around budgeting, time management and academics. Tyrell believes the forum gives students realistic and useful information that they wouldn’t get from visiting campuses or hearing presentations from visiting schools. Claudine Tyrell coaches the Malvern rugby team. On this day, Tyrell is meeting with Grade 12 students in the library. “How many of you have a spare this year?” she asks. Something else new that Tyrell is managing this year is a caring adult program. Last year, members of Malvern’s professional learning community explored the concept of providing a caring adult for students identified as being at risk or for those who just need a trusted adult proactively involved in their school life. “It’s important to support all children so they feel safe and comfortable and happy at school,” she says. Tyrell is willing to share and support students and colleagues alike. “I have been and continue to be very fortunate in being exposed to some fantastic mentors in my career, and I want to give back and help other teachers in any way I can."